The classes aim to develop different qualities and abilities with no predetermined measurement of success. The efficacy is determined by the individual and achieved by constantly pushing one’s limits with attention and care for one’s health. The more attention one has while exercising, the more one’s innate qualities will emerge, such as flexibility, clarity, physical fitness, strength of movement, concentration and the like. Classes are offered as a series of weekly 1 to 1.5-hour meetings over a specified number of weeks. The exercises learned can be used in daily life. This class is based on the premise that to be active, yet relaxed, will bring about greater efficiency and satisfaction. Thus it teaches relaxation not only through passivity, but also through being active. Through exercises that focus your attention, quiet your mind, train your breath and involve simple movement, you will change how you physically hold extra effort and tension in your body to reduce your overall level of stress. The objective of this class is to affect the quality of muscles in the body, their strength, level of flexibility and their ability to relax after making an effort. Through a series of exercises, which are short and varied, you will involve the entire muscular body while avoiding the use of repetition as a way to build muscles. Attaining a higher level of fitness would not be measured by how much more of the same exercise you manage to do or by increasing the level of difficulty. Instead, it would be determined by the development of greater muscular control and articulation, strength, ability to move, flexibility, stamina and breath capacity. Ultimately, for your personal assessment, you will want to notice that you have more energy to invest in your daily life. This class is based on the premise that the state of concentration is achieved through the whole body and is not produced solely through the head. By using exercises that move your attention to the body and focus your will, you will actively create silence. Emphasis will be given to concentration while reading and writing. The class is adapted individually. Using questionnaires you will determine your level of concentration and describe your patterns of lack of concentration. You will then be able to use the questionnaires to measure your results. Some of the more tangible outcomes of this class are greater efficiency in work and study, increased clarity in different subjects, reduced symptoms in the head, neck and shoulders and a greater capacity to stay focused for longer periods of time. By following certain concepts and principles, this class uses many different kinds of movements to music to achieve a powerful, precise and rich way of moving. A main target of the class is to combine physical training with the pleasure of movement. You will discover and develop your own possibilities to move, while avoiding repetitive muscular effort and without being taught to follow specific motions. Being at ease, moving with enjoyment and confidence, fluidity, adaptability and strength in the body will be some of the outcomes of this class. 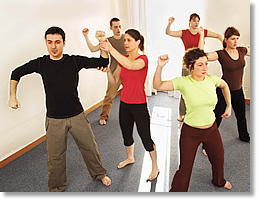 The class is for those who enjoy and want to further develop their capacity to move. It can be for professionals—dancers, performers, people practicing any type of martial art and others—or for non-professionals who wish to explore and develop their movement abilities. Currently three sequential levels of the class are offered. Good physical condition is required in order to participate in all levels.